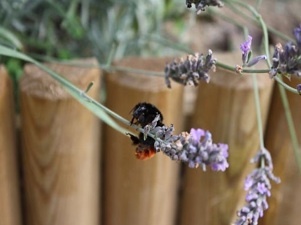 The Old Dairy has been converted into a lovely, light and spacious gite for up to 8 people with 3 comfortable bedrooms and 2 bathrooms and a large kitchen and dining area. 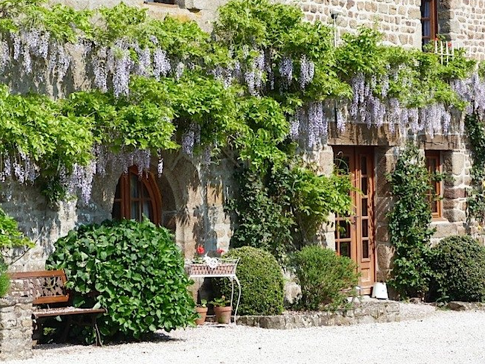 The Old Dairy was the original milking parlour of this beautiful 17th century farmhouse, where farmers would churn tons of Normandy’s famed butter, cream and milk. On the ground floor, there are two bright and sunny bedrooms, each beautifully decorated with local artisanal furniture. 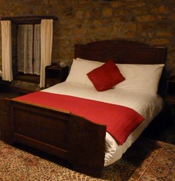 One is a large double with an oak king-size sleigh bed and double doors leading out to the front of the property. 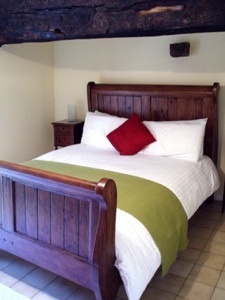 The twin room has two single beds and a view out to the gardens at the rear of the house. There is also a modern shower room with heated towel rail. The third bedroom, a luxurious king-size family room with en-suite bathroom, is on the first floor and has a pretty Juliet balcony with lovely views. The ground floor living and kitchen area is bright and spacious and here you can find a large range cooker and fully equipped kitchen with microwave, fridge freezer, washing machine, dishwasher and coffee maker. The dining table seats up to 12 and the living area has comfy sofas and a TV and DVD player. Feel free to choose films from our comprehensive DVD library at any point during your stay. Free WiFi internet is available. 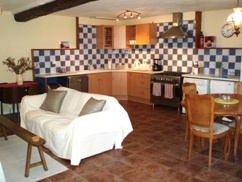 The Old Dairy can also be rented as a smaller gite for up to 6 people (non-peak only). Please ask us for more details. All prices are in UK pounds for the property per week. If you would like to pay in Euros or other currencies, we will provide prices at the latest exchange rate. Our week runs from Saturday to Saturday although we can be flexible, depending on existing bookings and time of year. In order for us to prepare the property, check in time is from 4pm. We kindly ask that you check out by 10am.